Intro: I love fresh hop beers. The use of wet, undried hops straight from the vine imparts a unique flavor to beer that you just can’t get from dried hops. The only time to find these beers regularly is in September and into November, right after 75% of the country’s hops are harvested out in Yakima Valley. Description: Pours a hazy, dark golden with large head that dissipates fairly quickly. Fresh, earthy green hops and considerable citrus come through nicely in the aroma. Big hops come through in the flavor, with a good dose of more green, earthy flavors, and big grapefruit. Some lightly sweet pale malt is present, and a little alcohol comes through. But, this is pretty much a hop bomb and it finishes with a huge bitter bite. Not saying that’s a bad thing, but a balanced beer this is not. Port gets a lot of citrus character out of the dried hops they use in this, but the fresh hop flavor is a nice compliment. Each and every fall, we experience a coastal experience in San Diego known as the “Super High Tide.” This happens later in the Fall Season when the tidal swings reach a range of about 8 feet in difference between low and high tides. When this happens, there are days when the tide just gets too high and flattens out the surf. The lineups shut down and surfers are left to wait until the High Tide recedes. You’re smokin’ crack. 🙂 I have to admit that I am not the hugest fan of Port Brewing. Hey, when your brewer refers to himself in the third person (shout out to The Tomme), your brewery has probably moved away from cool and toward douche-y. 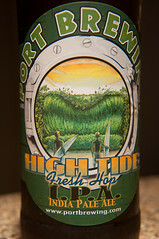 High Tide, however, is the best beer I have had from Port or Lost Abbey in a long time. Certainly better than the aforementioned Sierra Nevada Estate Grown = worth trying.